I am both excited and encouraged by the response of my work on SMART Power and women's leadership. We are at a major turning point in the history of business. The purpose of business can be forever elevated as a means to improve the quality of life of everyone—customers, employees, suppliers, and communities. In a sane and sustainable world, profits should be a byproduct of genuine value creation. I believe women are naturally designed to be the new voice of business leadership. Not one that mimics the shortcomings of hard power (the willful drive to get immediate, self-enhancing results), but rather the amplifier of something I teach called SMART Power. This lesson blends soft power collaboration with the goal of achieving the energy for hard power to create genuine human benefits. The toxic combination of hard power leadership and the tools of technology are causing unnecessary suffering and creating an unsustainable future. All attempts to create long-term thinking, value for the common good, purpose-driven enterprise, and sustainable abundance among leaders who are driven by self-interest and competitive dominance have failed. Hard power thinking is a distinctively male trait that is consistently rewarded in business enterprises. SMART Power leadership, which harnesses the disciplines of hard power with the collaborative values of soft power, enable organizations to reach all their objectives by creating an ecosystem of value for customers, employees, their communities, and owners. Remember the 90s when we thought we were entering into a new era of enduring peace and permanent prosperity? We won the Cold War, and Alan Greenspan informed us that the economy could be managed to eliminate the risk of deep recessions. It did not work out that way. The hard power orientation toward force, violence, and greed has made the last 15 years look like a descent into a spin cycle of never-ending terrorism and economic uncertainty. I believe this force will continue unless there is a revolutionary change in how leaders lead, the vision that we pursue, and the behaviors that we reward. We need leaders with a new mindset and bigger goals. My experience, combined with the findings of neuroscience, is that women are uniquely equipped to deal with the complexity and uncertainty that plagues our times. My conclusion is that if we are going to save the world from the self-destructive habits of humankind, we need to elevate leadership impact. This impact means we need to train more women to lead with their distinctive female strengths and advocate for their elevation to strategic level leadership positions if we are going to change the future. 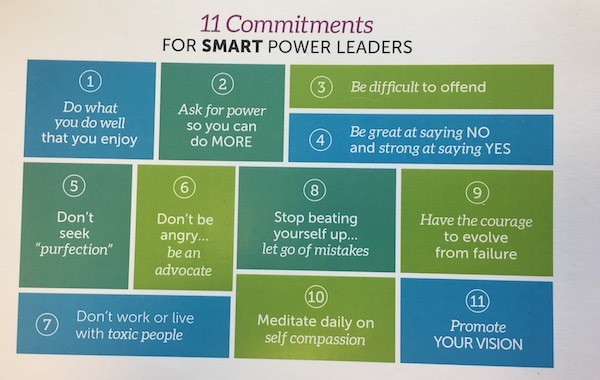 That's why I founded the SMART Power Academy and A Million SMART Women to teach these 11 Commitments for SMART Power Leaders. Do what you do well that you enjoy. Ask for power, so you do MORE. Be great at saying NO and strong at saying YES. Don't be angry . . . be an advocate. Don't work or live with toxic people. Stop beating yourself up . . . let go of mistakes. Have the courage to evolve from failure. If that doesn't intrigue you, I want to give you a taste of what a SMART Power Academy feels like. So, here's a video link that will immerse you in the promise of 30 extraordinary women learning together how to amplify their impact and make their difference. The soundtrack is unique. It's a song by a 27-year-old singer-songwriter, Hailey Johnson. Her voice and lyrics capture the energy of a younger generation who see their challenges clearly and are unwilling to sit on the sidelines. If there was any time that the video was worth 1,000 words or even 10,000 words, this is it. We will be launching our online Career Course this month. Subscribe to our email list to stay current on events and insights. Right now, take three minutes and see if this music video ("She's What We Need") inspires you. Here are a few of the valuable lessons expressed by some of the women who have attended a Leadership SPA, or are involved in our initiative, A Million SMART Women. "Be calm and be clear; when I lose my calm, I lose my power." "Now I know the easy way to become an expert in my industry." "Women leading like women instead of mimicking men will result in more business success." "Every female leader needs to live by the 11 commitments of SMART Power leaders." "I have new tools to increase my influence and gain the support of others." "Now I feel like I'm ready for my new position." "I have the mindset to be courageous and the grit not to give up." "Saying no is actually saying yes to something more important." "I now feel confident about my future." If a Leadership SPA would benefit your organization, go to The Leadership Spa, and join our email list to be notified when registration opens for an upcoming event, or email us about bringing our event to you.